1 Rinse asparagus, cut off woody ends and peel lower third of the spears if desired. 2 Cut asparagus tips about 3 inches long and cut the remaining portions diagonally into 1 cm (approximately 1/4-inch) pieces. 3 In a pot, bring 1 liter (approximately 1 quart) water to a boil with 1/2 teaspoon salt and the sugar. Add all asparagus pieces and cook until crisp-tender, 4-5 minutes. 4 Lift out asparagus with a slotted spoon, rinse in a seive with cold water and drain. 5 Peel and chop the shallot. Rinse the parsley and shake dry. Peel the potatoes, halve and cut into very thin slices. 6 Heat oil in a pot and sauté the shallot and 2 sprigs of parsley. Add potatoes and the asparagus cooking liquid. Bring to a boil, then simmer for 20 minutes. 7 Meanwhile, cut off the rind from the cheese and cut cheese into very small pieces. Squeeze lemon. 8 Remove parsley sprigs from potato mixture. Puree mixture with an immersion blender in the pot. Stir in soy creamer and cheese. Reduce heat and cook until cheese is completely melted, stirring. 9 Pluck the leaves from the remaining parsley and chop finely. 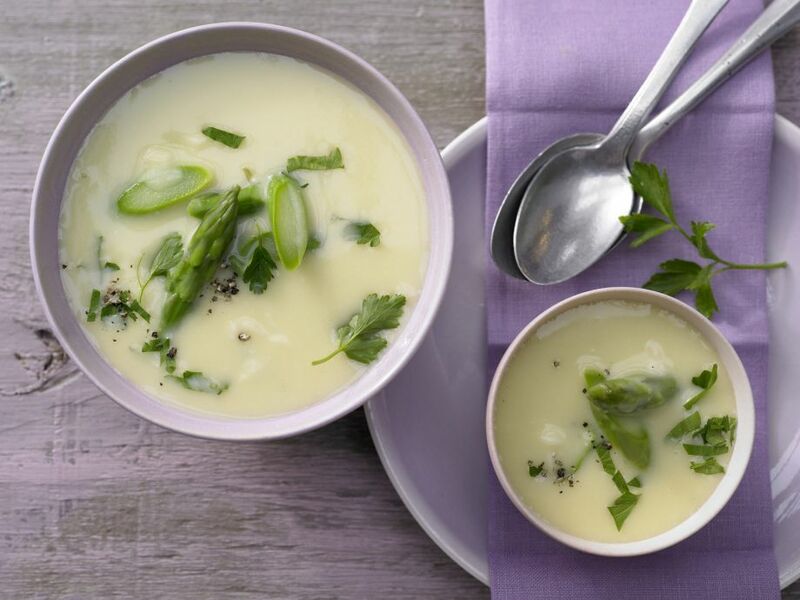 Season cheese soup to taste with lemon juice, salt and pepper. Add asparagus and heat until warmed through, stir in parsley and serve.